The Winter Soldier returns ready to do battle in the latest Infinity War photo, and his new bionic arm looks more formidable than ever before. 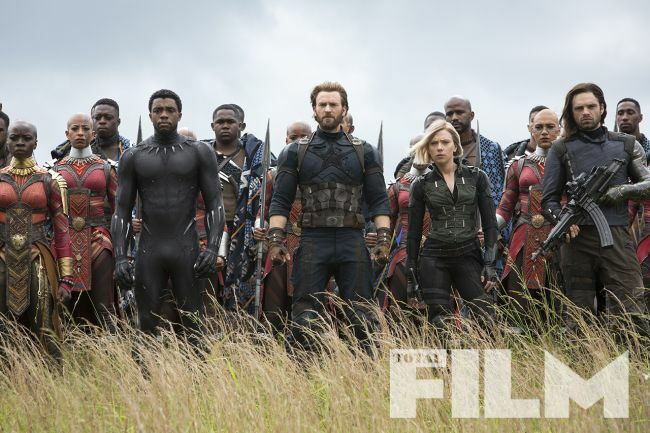 A new photo released Wednesday by Total Film magazine, and shared via its sister publication GamesRadar, shows Okoye, Black Panther, Captain America, Black Widow, and the Winter Soldier lining up with Wakanda’s army, readying for battle. It’s the clearest look we’ve gotten yet of the scene from the trailer. Okoye and T’Challa look just as they did in Black Panther, but the other three heroes have new looks for Infinity War. Yes, there’s Cap’s majestic new beard and Natasha’s blonde hairstyle, but most importantly, we get a better look at Bucky’s new arm. Remember that in the Black Panther post-credits scene, Bucky woke up in a Wakandan hut revitalized and free from Hydra’s programming thanks to Shuri, but he was still missing an arm after his fight against Iron Man. So he gets a new one between then and the events of Infinity War, and it looks pretty incredible. A new version of Team Cap lines up for battle in Wakanda. Bucky's new arm is much different than his last one. This new arm is much darker than his previous one and has a golden trim. His previous arm was lighter, shinier, and had a communist red star on the shoulder. Shuri probably made this new arm for Bucky out of vibranium and outfit it with any number of other augmentations. Bucky wields that new arm during what many are calling the Battle of Wakanda. At one point in Infinity War, Thanos sends hordes of his minions to attack the capital city of Wakanda. (Most people think the Soul Stone is hidden there.) Somewhere also present at the battle are Bruce Banner, War Machine, and Falcon — judging from the epic team-up shot the official trailer ends on. One thing’s for sure: We can’t wait to see what Bucky’s new arm is capable of. Avengers: Infinity War is due out in theaters on April 27.